3,200 strokes per minute, so very powerful and ideal for professional grooming use in training academies or salons. Detachable blade system for quick and easy blade changes of all Oster A5 blades - interchangeable with all A5 style blades (Oster, Andis, Wahl, MGT). Heavy-duty dual speed clipper with universal, powerful 2-speed motor. Runs quietly, efficiently and of course reliably. New style 'Soft Touch Finish' for a comfortable grip allowing for many hours of grooming. This is the newest design just out! Easy maintenance for a longer product life. Comes complete with a 1 year limited manufacturer's warranty upheld by the Oster UK distributors. Boxed in colourful retail packaging complete with free clipper & blade lubricating oil, electric clipper grease and an Oster clipper cleaning brush. Can be used with any animals such as dogs, cats, horses, goats etc. - both on a professional basis and also for home use. Very easy to use. 230V. 60Hz. 45W. Proudly made and assembled in the USA. Model 078005-900-600. Oster Comfort Series Soft Touch Design. This Oster clipper is not supplied with any blades, but Oster, Andis, Wahl or MGT blades can be purchased from us at the best UK prices. Please call us on 0844 800 9907. This brand-new design Oster Golden A5 Comfort 2 Speed Dog Clipper is the newest version of the very well known Oster Golden A5 dog clipper range. These Golden A5 Dog Clippers are available with single speed and twin speed clipper motors, and usually come with the standard grip design. These standard Oster A5 dog clippers are not the new 'comfort' dog clippers with the innovative soft touch grip sold here, which absorbs vibrations much more and is thus called the new 'comfort grip' with soft touch. 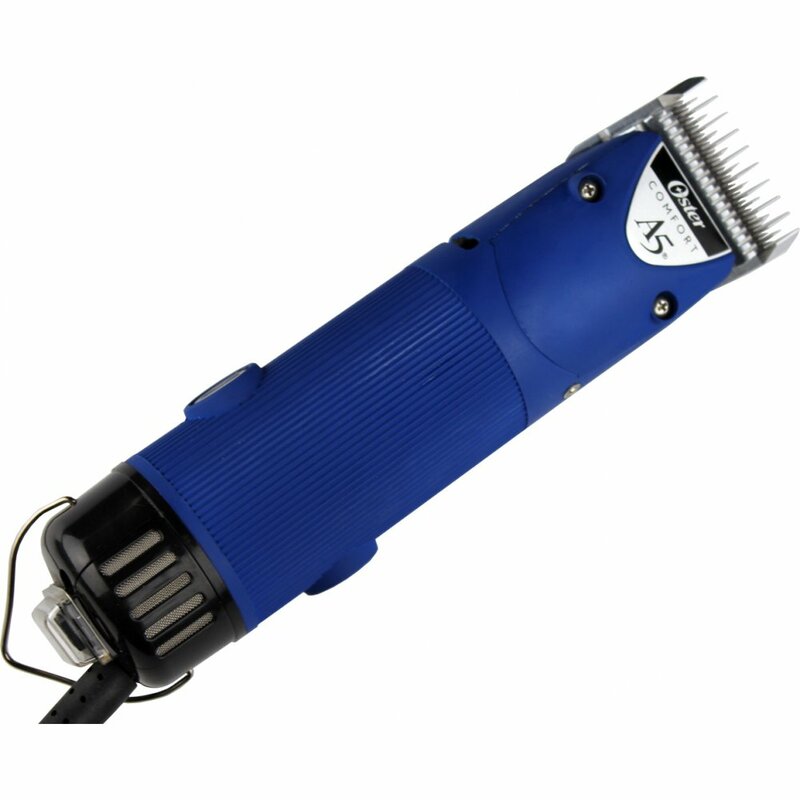 This newest Oster Golden A5 Comfort 2-Speed Dog Clipper comes in a marvelous deep blue colour and has a covered switch at the bottom, which allows you to change the motor from one speed to another. The professional Oster Golden A5 Comfort 2 Speed Animal Clipper also comes with a very durable, thick cord with respectable length and a fused UK plug, along with a tube of Oster Electric Clipper Grease (9.4g) and a tube of Oster Clipper & Blade Lubricating Oil (14.8ml) with a supporting Oster clipper cleaning brush. All these items come neatly packaged in the original Oster Golden A5 Clipper Box. We also sell the Oster Clipper Lubricating Oil separately in larger bottles, along with products such as Oster Kool Lube and Wahl Hygienic Spray. These are all essential items for clipper care & the smooth running of your dog clippers. 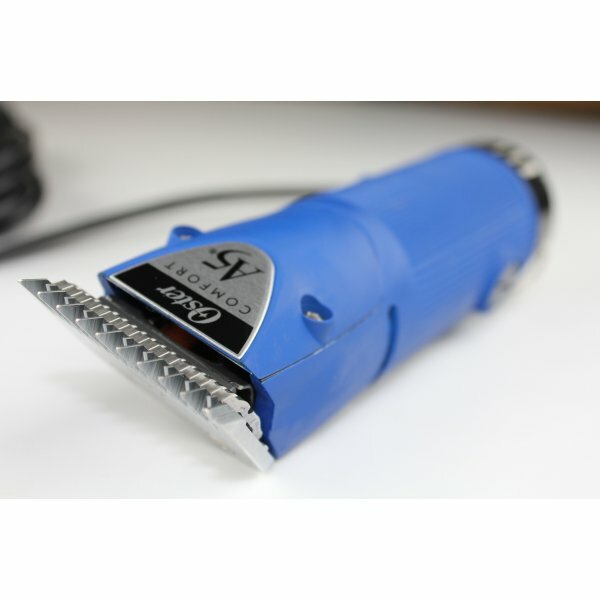 These cool running clippers are a very popular choice for professional groomers, in the dog show exhibitor world, kennel owners and private dog owners. These can be used to clip fur of dogs, cats, goats, horses and any other animal whose fur may need clipping. The 2 speed motor allows groomers to clip different animals and different coats. The lower setting out of the two settings allows you to clip more sensitive areas or frightened animals, whereas the more powerful setting is designed for thicker coats and animals, who do not mind the noise of the clipper. The universal, quick detachable blade system allows for quick changing of blades depending on coat type and cutting length. We also sell the clipper comb sets, which act like clipper guards on blades and allow you to cut certain length of coats without any hassle. We of course also stock the entire range of blades, which can be used with these newly styled and designed Oster 2 Speed Clippers making these one of the most popular dog clippers in the market. As these are interchangeable blades, you may use the Oster Cryogen-X series blades, but also blades such as the Master Grooming Tools (MGT) Silvers Series, Andis UltraEdge blades etc. We stock the entire range of blades: no 50, 40, 30, 15, 10, 9, 8.5, 7F, 7, 6F, 5F, 5, 4F, 4, 3F, 3, 5/8, 7/8 etc. Please note that not all numbers are available in each make of blade, as the availability depends on the brand. If you require any assistance picking your dog clippers, please give our helpful customer services team a call on 0844 800 9907 - we stock the entire range of clippers made by Moser Wahl, Oster and Andis.